We humans are really good at torturing ourselves and others over everything under the sun. 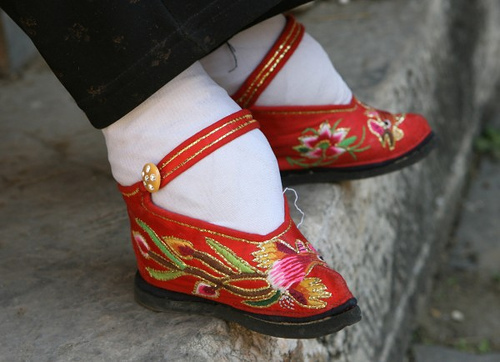 The Ancient Chinese were guilty of foot-binding, stunting growth and crippling their daughters’ feet to make them more eligible for marriage. Yet aren’t all of us guilty in some way for maiming our children with our hopes and dreams for them without considering who they are as spiritual beings? This piece of highly controversial art raises many questions. Is the artist being manipulative? Or does his work help people by asking, are you going to let someone else’s hopes define who you are for an entire lifetime? How committed are you to pleasing your parents? It takes courage for any woman to reveal her femininity. Even more so if this side wasn’t cherished at all, or caused deep wounding. Further, it takes Herculean courage to actually step outside the mold and refuse to be shaped by other people’s dreams or agendas or social expectations. Personally I think that humanity isn’t quite ready to face the truth about itself; that gender is superficial and transient clothing on spirit, which is eternal. The reason is perhaps a fear of being stereotyped or labeled while in fact, spirit is a verb not a noun. Perhaps we are physically attracted to the person who can help us grow the most at any given moment in time? Your current gender is just a short blip on the radar of who you really are. The real question is – who are you in spirit? What are you up to this time round? And how are you built to shine? Bleyer mentions the work of Lisa Diamond, a prof from Utah University who has spent the last 20 years researching what she calls sexual fluidity – “the tendency of women’s sexual attraction to be triggered by particular relationships or situations, unconstrained by whatever they may conceive of as their typical sexual orientation.” Her book looks like to might be quite heavy going to read, but worth it if you are busy torturing yourself or someone else over this topic. Still I wonder, why in our society is it women who claim fluidity and not men? In ancient Greece wasn’t it men more than women who expressed this characteristic? I think the answer to this lies in the work of Arnold Mindell on rank. Perhaps in our society, women have more freedom to perceive or define themselves more loosely than men currently do, because they have less to lose? It seems we are always looking for some kind of pecking order, or way we are different or better. When in fact we are all one, and deep down we know this. We tend to judge or condemn others most harshly when they reflect whatever it is we don’t want to see in ourselves. But the humor in this is – the people around us are our most honest mirrors. Back to the question: are you gay or straight? You are a spirit having a human experience. And you will only know in hindsight what the gift is wrapped up in each experience you are having. In this case, whatever is happening could be happening to get you to unplug your spirit from “group think” so that you can grow more rapidly. You will never know in the moment and you should never judge. Most population groups follow a bell curve graph, in this case with +80% being neither one or the other. However, you could easily be in the small percentage that really are not fluid. If that is the case then cherish this as best you can. Find yourself a positive role model . For example, the director of The Matrix Larry/Lana Wachowski who is married to a supportive intelligent woman and, at the same time embraces his transgender side. As always, it is good to remember, life happens for you, not to you. Larry/Lana could never have made such incredible films without all his/her intense personal experiences. Just remember, this is a supportive universe and everything that happens to you serves some goal that mostly you will only appreciate in hindsight. In this instance, unplugging your energy from group-think. You grow faster without a group. Until you find a group growing as fast or faster than you are. Let’s discuss each one separately. As painful as it may be to feel rejected or different, it is the stories you tell yourself about yourself or other people that are the real danger. If you can learn to manage your energy you can totally change present and future outcomes. Shifting oneself away from victim or judge to seeing oneself or others with kind eyes. This is about being present in the moment (feeling your feelings) separate from the stories you telling yourself, other people about whatever is going on. There are numerous experts in this field who can help you master mindfulness, some of whom I’ve interviewed here on Earth School. Read my post “what’s eating you?” for a clearer understanding of this. It is possible you are making an intellectual decision rather than a genuine feeling decision because, due to early wounding, you are not yet fully in your body. Someone who could help you understand this is from a broader spiritual perspective is Caroline Myss. 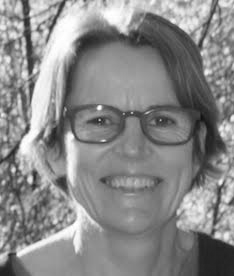 For example her work on energy management and spiritual growth. (Energy Anatomy (audio series) /Anatomy of the spirit (book)). Sometimes you experience feeling different (wrong color, wrong ethnic or language group, wrong preferences, wrong nose shape or whatever way you feel apart, wrong or different from the norm) for a very important spiritual reason, and that is to force you to stop investing your spirit in a group that is moving too slowly for your own needs. Your differences force you to unplug your energy from the group mind/broader community, even your family so that you can grow faster on your own, without being held back by the pace of the group. This can be quite traumatic without seeing it from a higher perspective. And the danger is to judge yourself as flawed, rather than that you are being guided to move on or manage where you are investing your spirit. In the worse case scenario this leads to deep depression or even suicide. Managing your power as it relates to the chakras: here are some summary notes on the seven stages of power described by Myss. Moving from the 1st to the 2nd stage one needs to let go of the tribe or any other group that is moving slower than you are. Radical re-framing: become an “inverse paranoid” – this is an idea first initiated by W. Clement Stone and more recently by Jack Canfield. Instead of breathing life into the idea that the universe and everyone in it is out to get you, adopt the attitude that this is a supportive universe and the universe is continuously conspiring on your behalf. To help you shift your perspective, explore having your hand analyzed to understand the larger context of your life, the core issues you are exploring and your larger purpose. This helps you see your life from a broader perspective, beyond current circumstances, towards a life of meaning and growth. If you live in a culture that doesn’t support who you are, try to move to one that does. Be careful that you don’t just switch from one bad tribe to another equally bad tribe simply because they accept you. You may need to unplug your energy totally from all groups for a period of time until you have learned mindfulness. This will then enable you to make better choices later when it comes to finding a group or community that is growing at the same pace as you are, or faster. We all need to run with the pack. Read my post on this about fitting in. You are an expression of divinity. Perfect exactly as you are. My advice is, stay open to love in whatever form it takes. And allow other people to love whomever they please. Also, try also not to put yourself in a box that you might find limiting one day. You are a verb, not a noun.